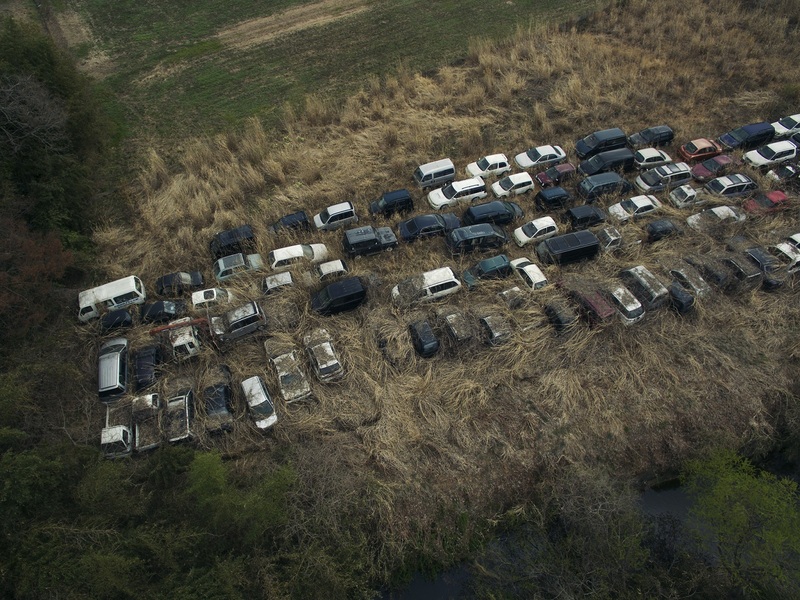 On March 11, 2011 a series of devastating events took place in Fukushima, Japan. A 9.0 magnitude earthquake tiggered a tsunami which went on to cause the worst nuclear accident since Chernobyl. 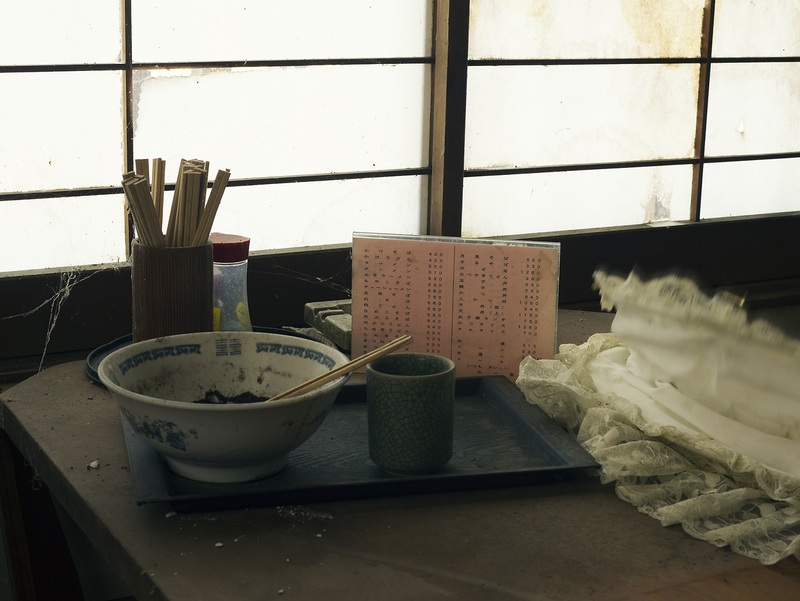 Well over 1,000 people lost their lives and over 100,000 were evacuated from their homes in an effort to prevent radiation sickness. 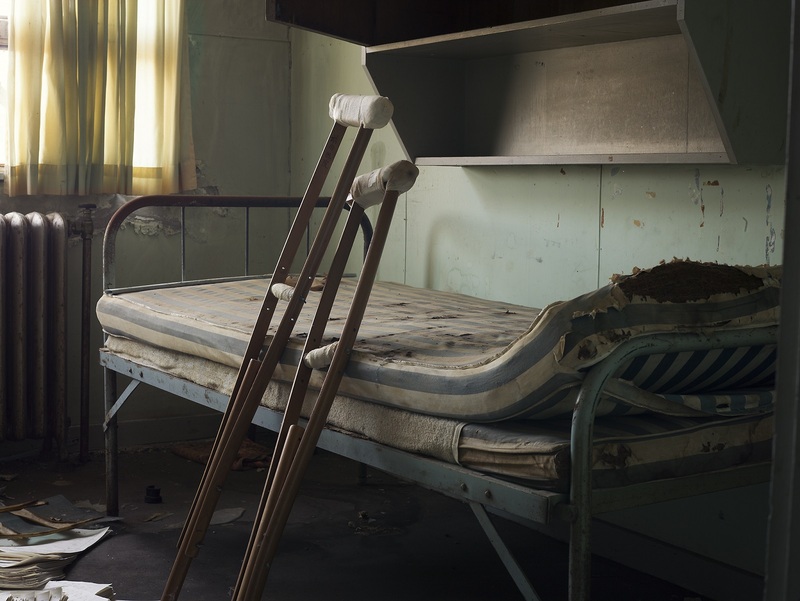 5 years later, Loweprofessional Rebecca Bathory gained access to this abandoned city and documented her experience through photographs. The following is her story. Why did you decide to go to Fukushima? 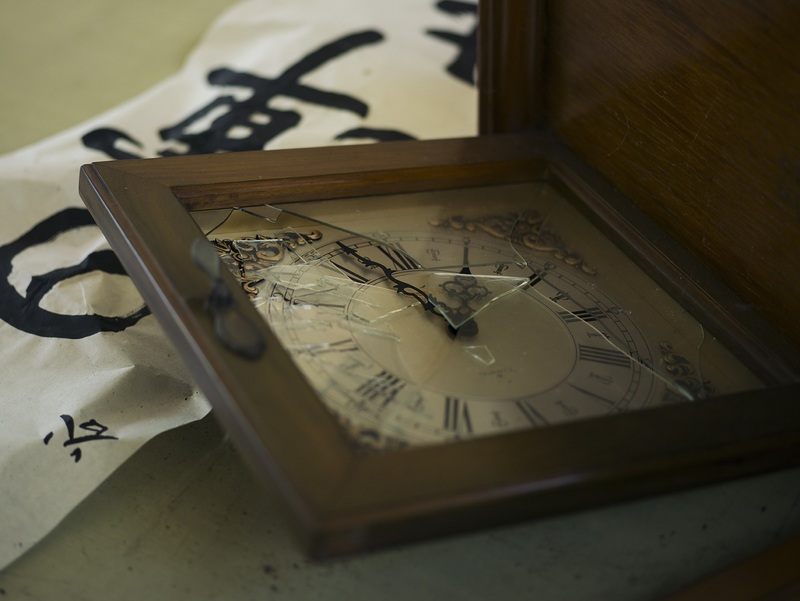 I wanted to capture how time has stopped. Photographers have shot there, but it is incredibly hard to gain access to the exclusion zones. I wanted to visit, but the fact that so little photos existed of how it looked at a moment in time made me want to go even more. I want my photos to capture the beauty that still exists in the area. Because, despite the tragedy of the earthquake and tsunami that caused the evacuation of the town, it is still a place of serenity and peace, possibly even more so as human life is removed and nature reclaims its place. 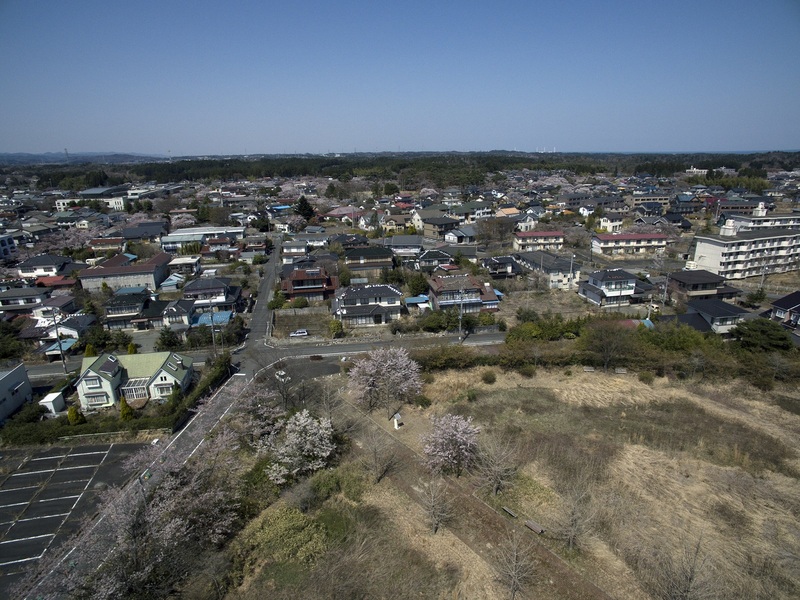 Hopefully, these towns will continue to be cleaned up and rebuilt and one day residents will return to their homes and build their communities back; much in the same way Hiroshima has become a thriving city again after the atomic bomb of 70 years ago. I hope that my images will be used for years to come as a reminder of that tragic day. And, to those who view them, I hope they show the fragility of human existence and how power such as this should be treated with care so as to not allow a tragedy like this to happen again; in much the same way photos captured in the aftermath of Hiroshima evoke those emotions. How did you gain access to such a restricted area? In 2016, I began to photograph dark tourism sites around the world for an upcoming book and decided I would like to visit. I began to make plans to go to Japan to see Hiroshima, as well as the infamous Japanese Suicide Forest and wanted to visit Fukushima at least for a day. I noticed a Polish photographer, Arkadiusz Podniesinski​, had been there before and had created a series of documentary photos that had been published in the media. I reached out to him about how he had gained access and decided to try my best to make it happen (with the new leverage of researching a Ph.D. in dark tourism and creating my new book). It was just a couple of weeks before my flight, and I noticed Arkadiusz was looking for a professional photographer to join him on a five­ day trip to the zone and couldn’t believe the dates coincided with when I would be in the area! I spent several days making last minute plans, arranging funds and rearranging flights so I could extend my trip to Japan so I could join him. He had previously arranged all government permits and permissions, and before I knew it, I was a part of his team. We were to visit areas of the red and orange exclusion zones. I consider myself very lucky as at the time of writing this not many photographers are allowed in these restricted zones. I expect that with time, as with Chernobyl, the area will open up, and tourists will be allowed inside to take photos. As clean up happens every day, the site constantly changes; and for me, it is important to capture it as it was in 2016 just five years after the tragedy happened. 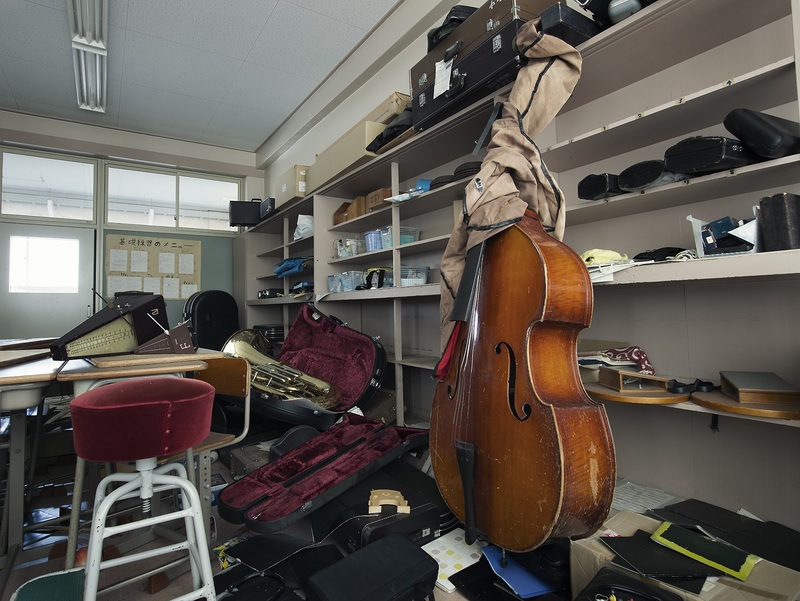 Fukushima will probably never reach the decaying state of Chernobyl, as I believe Japan’s massive cleanup efforts will see this place one day habitable again. What did you take with you for the trip? For those five days, I used my medium format Mamiya Leaf Credo 80 to capture the shots in high 80 mp resolution. I shot from a 3 Legged Thing Steve tripod and LEE Big Stopper filters on some of the outdoor shots – all carried in my beloved Lowepro ProTactic 450 AW. 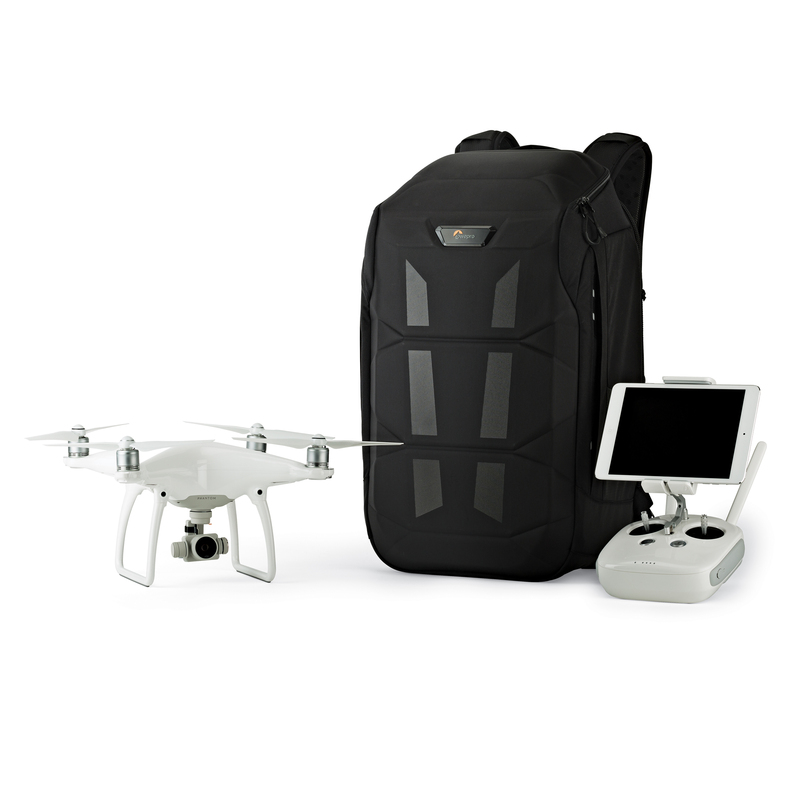 I also brought the DJI™ Phantom 3 Pro packed in a Lowepro DroneGuard 450 AW to capture aerial shots to give a different perspective. Walk us through your trip. What was it like to be in these areas? 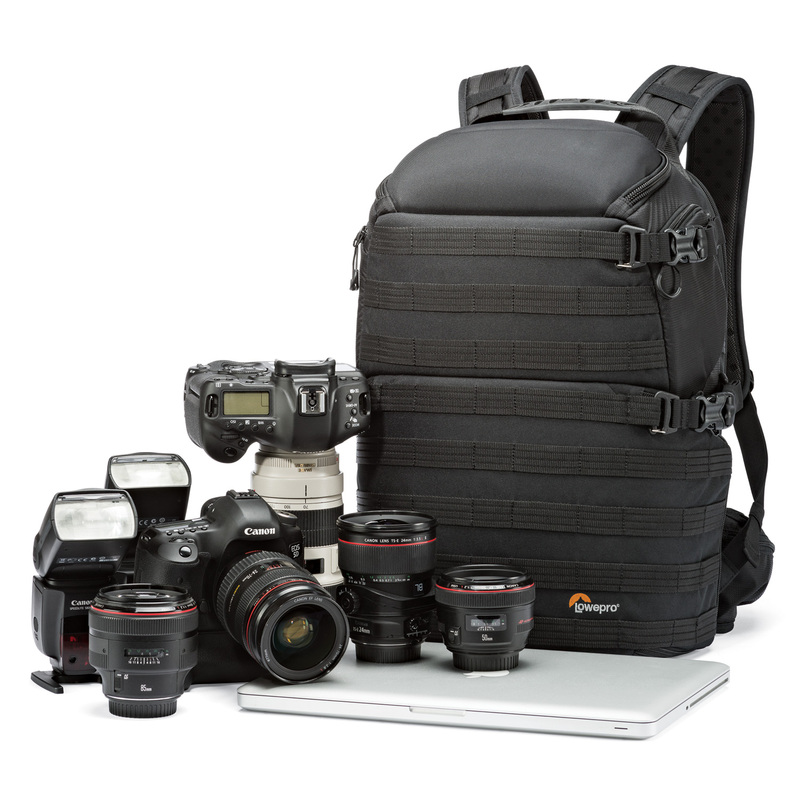 On the first day of the trip I awoke at 6:00 a.m.; I had my ProTactic 450 AW full of camera equipment on my back and my DroneGuard 450 AW backpack carried on my chest. I survived an hour train journey, in Tokyo rush hour, to meet Arkadiusz and his driver on the outskirts of Tokyo. I chatted with Arkadiusz about his intentions for the trip; he had just gotten off a plane from Ukraine, as he had been visiting Chernobyl, where he has been over fifteen times. 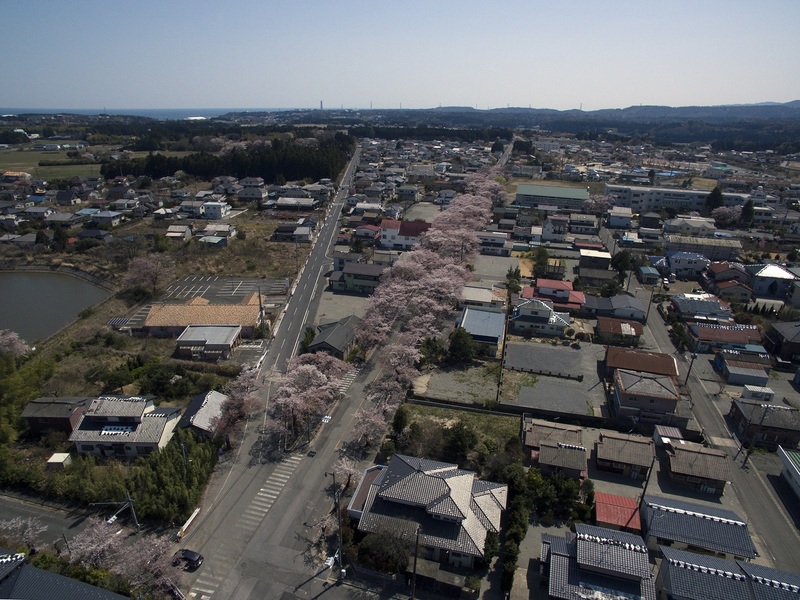 I asked Arkadiusz why he was returning to Japan and he replied he wanted to photograph the town of Tomioka (our first stop) as it was famous for its cherry blossoms before the disaster. He also wanted to come back to film and explore some places he had not yet been. 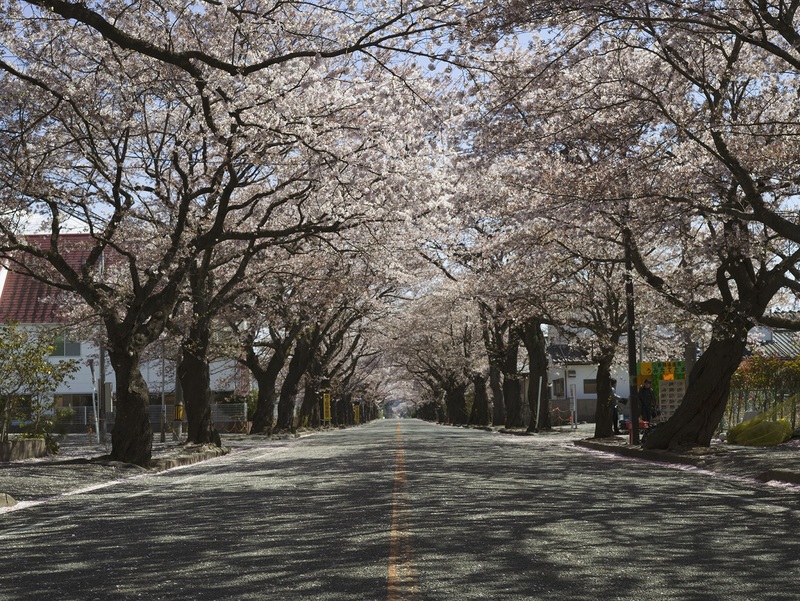 Upon arrival into Tomioka, the checkpoint of the red zone was the cherry blossom tunnel that this town was once famous for. 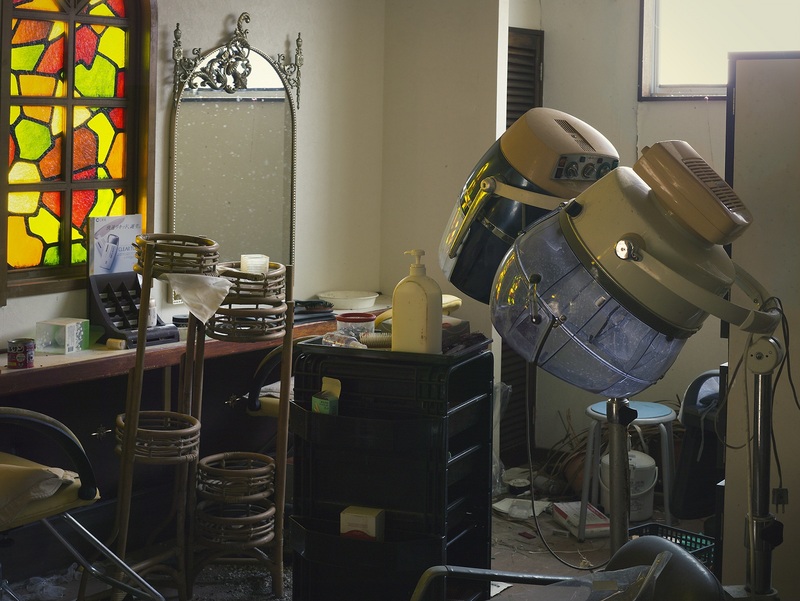 Despite the radiation, it thrived and held so much beauty in a town torn apart by destruction. We spent some time photographing the cherry blossoms and then drove to some areas in the orange zone. 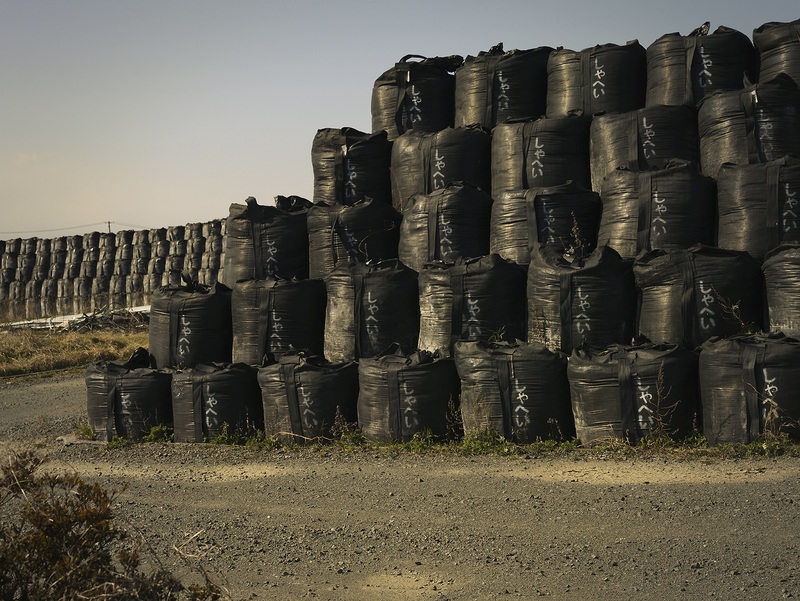 The first site we visited was by the sea, where there were thousands of garbage bags that had been stacked up, containing nuclear waste. This was quite literally where the tsunami had come in and wreaked havoc across the land. Buildings were slanting to one side, cars on their roofs rusting by the side of the road. Those clean up bags would become a familiar site throughout the exclusion zone in the five days we explored. Then, we began to wander around Tomioka, where we had to be cautious as no one is allowed to be in the buildings. 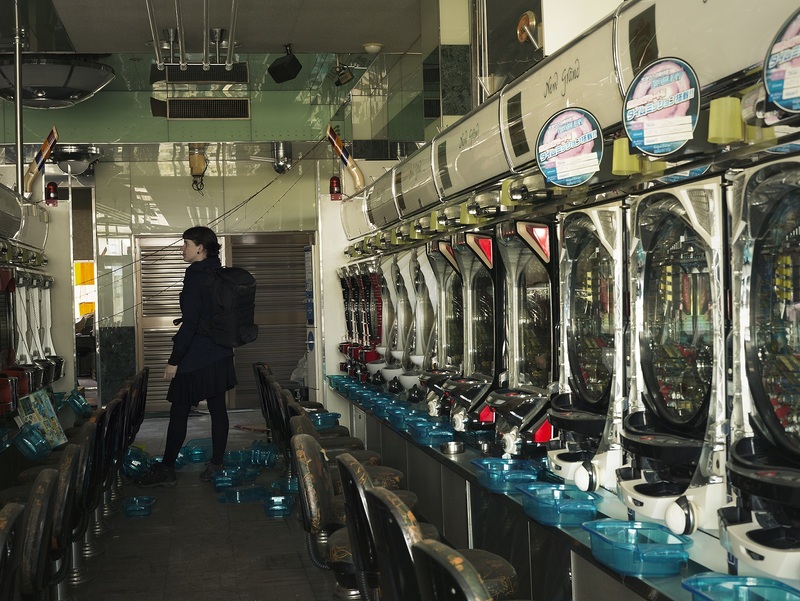 We found a supermarket, a home, and a Pachinko Casino. For me, it was exciting to discover these buildings because, unlike a lot of abandoned buildings I visit, these were untouched; left exactly as they were on the 11th of March 2011. After some exploring, we returned to the cherry blossom tunnel where a TV film crew had been setting up lights – they were to film live at 11:00 pm. So we decided to take this chance with the cherry blossoms lit up to capture some eerie photos of the street. The sun went down and the cold wind began blowing. Even with Arkadiusz and the film crew nearby, I felt chilled by this street. DAY TWO:​ We woke at 6:00 am and after a quick breakfast headed to the Tomioka town hall to meet an official. We had been granted permission to explore the red zone alone for three hours. This was very exciting for both me and Arkadiusz, as the last time he had made it inside, his official had not let him out of sight. Together we checked building after building. Each one slowly building a picture in my mind of that fateful day. 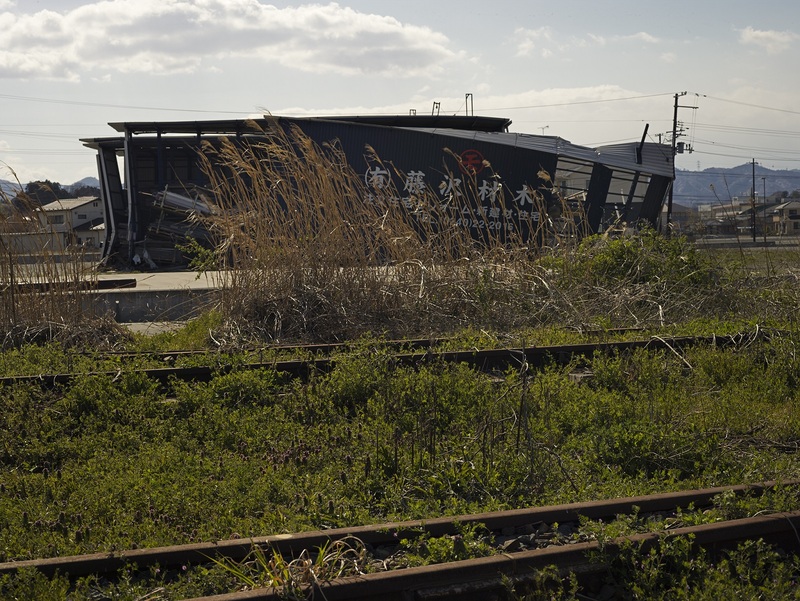 I had not researched too much about the disaster before the trip; I wanted to see it with my own eyes and have my feelings and thoughts be my own. I needed to form the story based on my experience there and it unfolded more and more as I viewed the exclusion zone. We found a shrine, a restaurant, a hospital, a bookshop, a hair salon, and a DVD shop amongst others. I was overwhelmed every time I entered a building knowing they were untouched since the disaster. Emotions began to build when seeing signs of the tragedy. 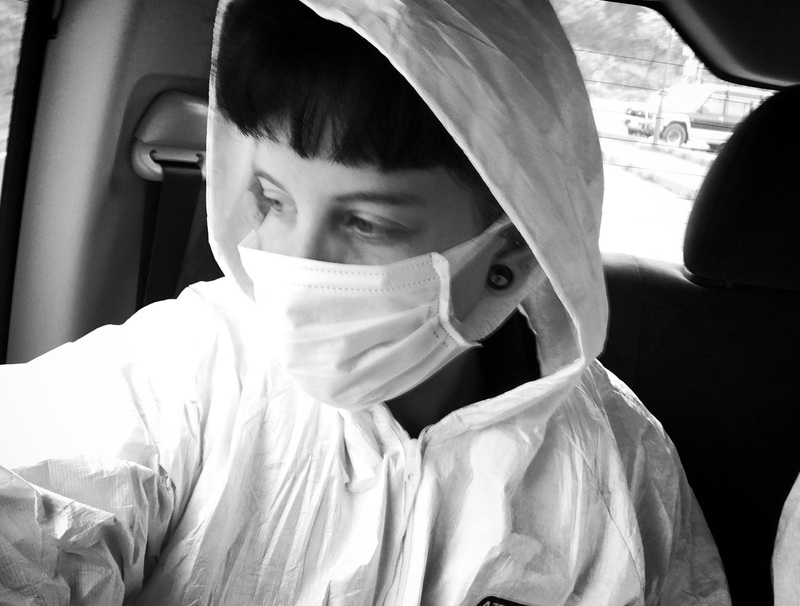 We had radiation checks on our way out, having our car and clothing scanned for contamination. With no signs, we headed to the orange zones for more exploring, finding various buildings to photograph. 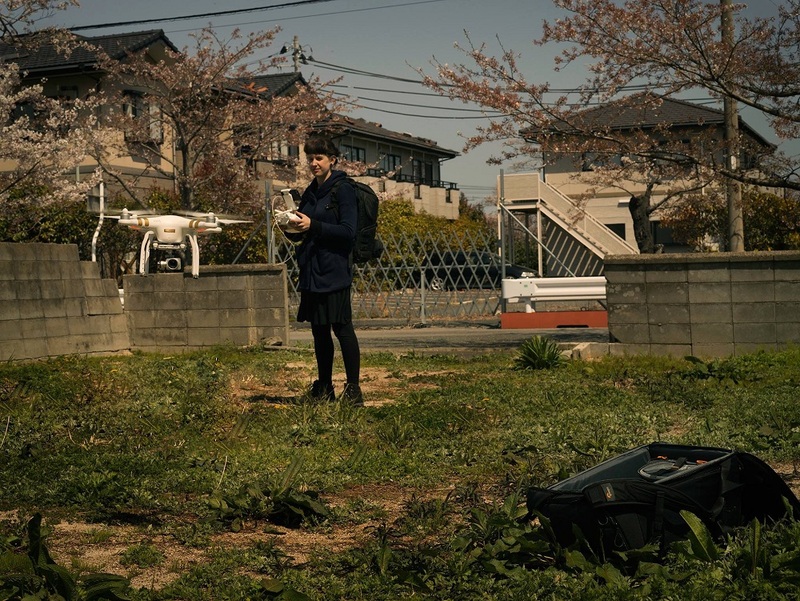 DAY THREE:​ It started off with lots of promise; we decided to fly the drone and get aerial footage of some abandoned cars. Unfortunately, the cars were inside the red zone and even though we were standing on the edge, it wasn’t long before the police had seen the drone and were coming to alert us that we were not allowed to be or fly in the red zone. Luckily, I had captured the drone shots and landed it before they came. But what commenced next was three hours of ten police, continuously checking our passports and generally telling us off for doing it. They proceeded to tell us where we could and could not fly the drone and eventually let us go. Even walking in the orange zones there is a high police presence and we got asked why we were there on many occasions. We had to be careful not to be seen in buildings; although our documentation of the area is important, the Japanese police did not see it this way. Red zones had authorities at the gates and were strictly forbidden to enter without an authority. We moved on and spent the rest of the day exploring Namie. Here it was different; the earth had shaken and things came tumbling to the ground. People would have been filled with terror and fled for their lives. 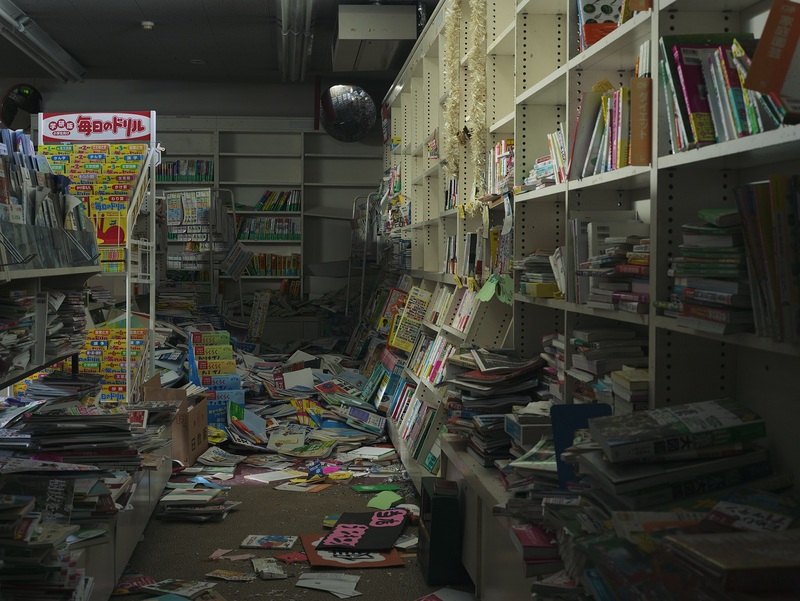 Inside the bookshop, there were fallen shelves with layers of books on the floor. 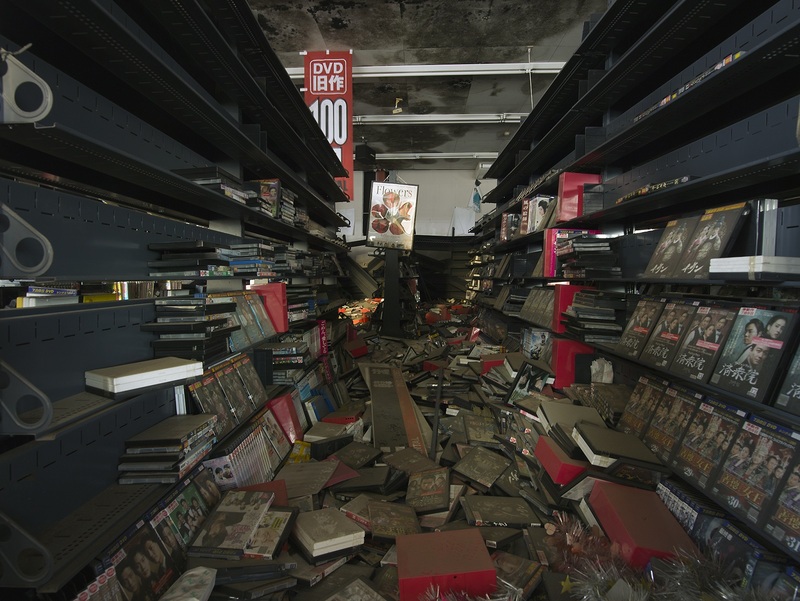 It was a similar site to the DVD shop inside the red zone where thousands of contaminated DVDs laid on the ground covered in dirt. I felt emotions unlike I’ve ever felt in an abandoned building before, people had fled for their lives, no chance to even take their beloved items or even to lock the doors behind them. For some reason the power was on in the bookstore, a computer still turned on, the automatic door covered with cobwebs opened half way and then closed again making an eerie noise. It was frightening until I realized where the sound was coming from. It felt as if the disaster had just happened yesterday – time stood still and yet these doors were on repeat over and over again. I walked over a layer of books; these books once had value and gave people a livelihood. People once took pleasure in walking those aisles and picking out their favourite titles to read. I felt unsettled walking over the books to take my photos. Books are special things and now they just laid there contaminated and decaying, my photographs being the last story told. As I snapped my last photo, a sudden deafening alarm shot through the building and Arkadiusz came running through the shop saying he had tripped an alarm; we ran to the car and sped away from the site. We returned an hour or two later to the sound of the alarm still going off. In a place as desolate as this, there was no living soul to hear it however, we decided to go inside again and turn it off. In the process, we found a photo album that contained photographs of employees wearing the same uniforms we saw earlier scattered on the floors. They smiled, holding books standing by the shelves with an array of brand new titles on them. Flicking through this album made me truly sad for those people could no longer work in that store – they lost their jobs and faced a new life so suddenly. DAY FOUR : It hit me hardest emotionally. Everything just kept unfolding as we drove, walked, and explored the buildings. The story began to build in my mind – some moments felt like I was living it. 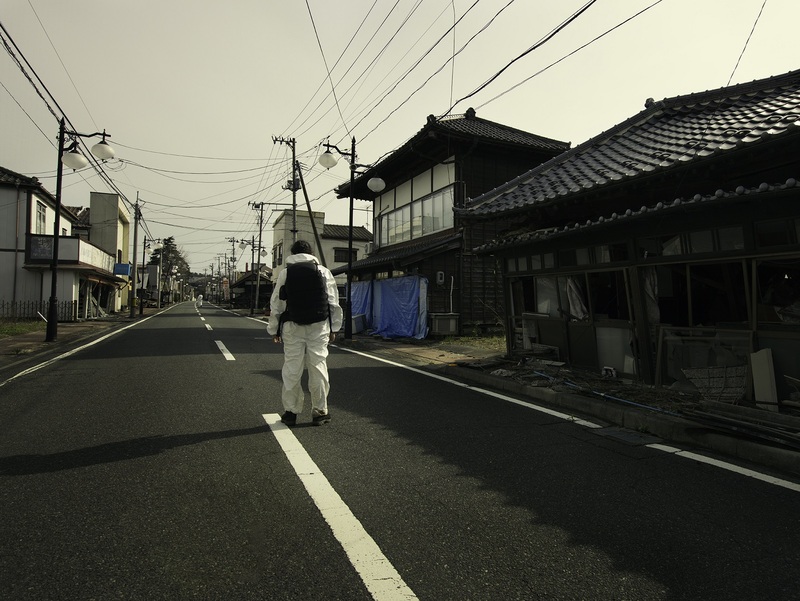 We put our radiation suits on to go in with a government official to explore the red zone of Futaba. It was highly radioactive, so much so that some areas were marked with red flags and we decided to only stay for a minute or two. We photographed the town hall and a race kart track. We also got the closest we could get to the power plant; I could see it in the distance. At the seafront in the red zone, we spotted a destroyed building with a ghostly watermark, proof of where the tsunami had reached. 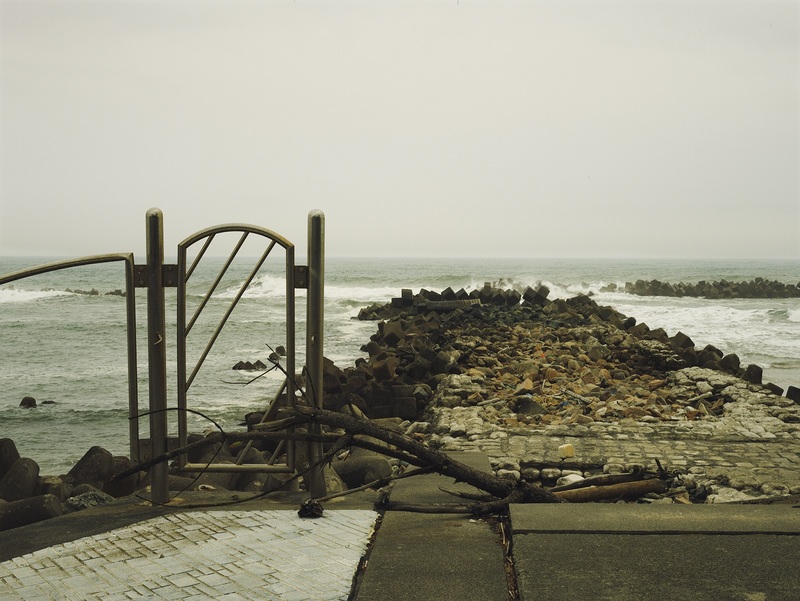 I watched the waves beat against the beach with metal gates twisted by the force of that once large wave; rusting rubble and pieces of buildings lay on the shore. I stood on what was left of a broken jetty that went crumbling into the sea and thought of that gigantic wave; it’s height completely incomprehensible. It swept in so quickly and caused so much chaos on the land and took so many lives. I cried at the edge of that jetty for how powerful nature is and how quickly life can be taken away by such a force. The day finished at a farm of a man, who after the accident, had gone into the zone and found over two hundred animals which he had taken back to his farm. I took photos of cats and dogs and ­ they loved the attention. This man had saved them and they live happily on his land. After a short drive, we went to another farm – one with a much sadder story. I wasn’t told what to expect. Arkadiusz knew I liked to take photos of dead things as he watched me capturing a mummified cat earlier that day however nothing could have prepared me for what I’d witness next. With the fresh memory of the happy living animals just half an hour before, I now faced pen upon pen of dead animals. Their bones were littering the floor of every single pen. Deeper into the pens, I saw heads hanging from ropes that had tied the animals to the railings. I photographed the scene but only to tell this story to others. The wave had swept in and killed hundreds of animals – they had no chance to escape. My heart was in my throat and at this moment, my soul was forever changed. It all became too much. Over the past four days, I had witnessed loss, pain, suffering, destruction, tragedy, chilling death, and decay. But this had been unlike any other abandoned building I have ever photographed. I know I will emotionally not be able to return here. It’s true the first couple of days I felt an excitement about capturing photos in the same way as I have done years previously, however, the rush of seeing something this unique was unlike what I’ve photographed before. That day it all changed; the story unfolded bit by bit and I felt true heartbreak. Almost like I had crossed a line of what I should and shouldn’t photograph. Maybe this is why many photos do not exist in the way I have captured them. It’s a heart-wrenching story – only now to be told through my photos. 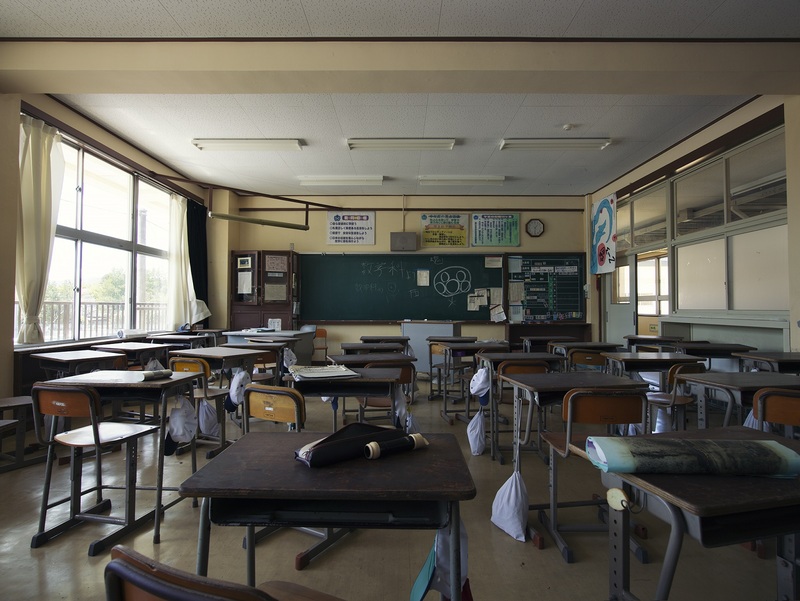 On our final day, we drove around looking for larger buildings and after a while, we found a school we could enter and we spent the next couple of hours inside. Our last stop was a supermarket inside the red zone; it was so close to the border so we snuck in amongst the tall grass and ran inside. 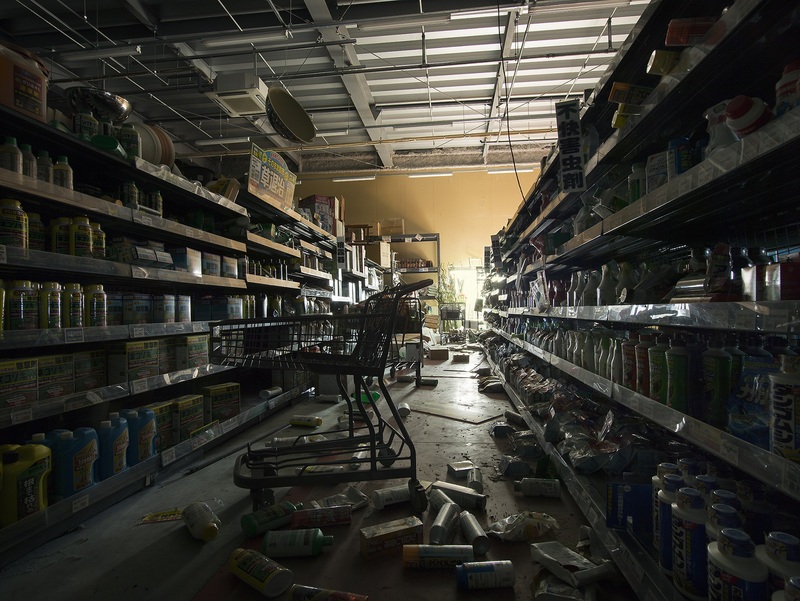 The supermarket was pitch black, and the stench of rotting food hit me the minute we were inside. As I wandered around, torch in hand, it felt like something out of a zombie apocalypse, produce scattered on the floor, exactly as it was from that day. As my nose slowly became accustomed to the smell, I wandered towards a skylight that was allowing filtered light to touch some aisles and provided me with enough light to being photographing. Time slowly started to run out; I took one moment alone in the dark to process those last five days and remember those that had suffered from the tragedy and to pray for each of them. With that, we exited and began the fight through the bushes once again to reach our driver on the edge of the red zone. Over a walkie-talkie, we asked him to come back to get us. We crouched down low until we could see the car pull up and then ran as fast as we could towards it. My heavy camera, which I had slung over my shoulder, hit my hip bone hard and I winced in pain while making my way to the car. My head was pounding and at that point, the emotions got the better of me. I sat in the back of the car in pain both physically and mentally and knew this whole experience had touched me far more than I had ever imagined it would. As we drove back to Tokyo, I was lost in the thoughts of what I had witnessed and know that I did my best to show the world through my eyes what this land is like to this day. CLICK HERE to learn about Rebecca’s next book, Orphans of Time. Follow along with Rebecca on her Loweprofessionals page. Check out Rebecca’s site and follow her on Instagram, Facebook and Twitter.